If you are reading this announcement, your website has been successfully moved to our new platform. 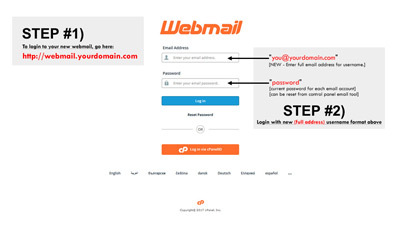 For instructions on how to access your site, control panel, email or webmail system, please review the below instructions. If you need additional support, please contact us below. 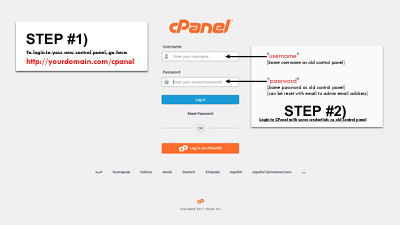 To login to your new CPanel, replace "yourdomain.com" with your actual domain and hit the "Log In" button on the screen. Enter your current username and password to access. The above area replaces the former control panel address. (Once logged in, you can choose between three great webmail packages). Select one as default, or try all three. 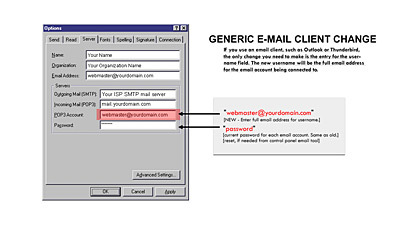 The above area replaces the former OpenWebmail system. If you use an email client like Outlook or Thunderbird, all you need to change is your username to the full email address format. SMTP Port: 587 IMAP, POP3, and SMTP require authentication.